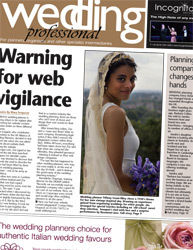 Wedding Professional is a vibrant new magazine dedicated to the UK's burgeoning professional wedding planning market. It is aimed at wedding planners, organisers and other specialist wedding intermediaries. Each issue is packed with news, comments, inspiration and informative case studies from respected names in this fast-developing sector. Today's discerning wedding couples expect more from what should be the biggest day of their lives. We are delighted with our advertising campaign with Wedding Professional. We believe that it's important that we have a presence in a magazine that is completely dedicated to our very specialised sector of the events industry. The team at WP is genuinely interested in working alongside planners (unlike the typical advertising sales person who just wants to earn a quick buck). They want to get to know what we want, what we don't and work hard as a really valuable news and learning resource for the good of the industry to grow it for the benefit of us all. I personally love your publication and think it's a great window to the trade. Once again you've done an outstanding job. It's very informative, relevant material, broad number of topics, interesting facts, with lots of good visuals. I'm amazed no one thought of Wedding Professional earlier. It's a much needed publication for a multimillion pound industry, with a good mix of news and features that reach the right people. I've been receiving copies of Wedding Professional for a while now and have to say I'm very impressed. There's a nice variety of articles and information and it's a great forum for like-minded wedding professionals. Vickie Cook, Weddings By Vickie Ltd.
April 2019 | Wedding Make-Up - Why you should hire a make-up artist for your big�day! All brides want to look their absolute best on their wedding day as�they are naturally going to�be�nothing�less than a celebrity for the day.�A lot of thought and money undoubtedly�goes into the�best�bridal gown, shoes, jewellery and photographer to capture their natural beauty, but often their face is left with the same make-up that they would wear on�a daily basis. These days there is so much product choice when it comes to foundations, concealers, eye make-up etc but a true professional make-up artist�always knows the best products to use to suit your individual look! As a bride, you don't want to try and create a new look yourself and to be unrecognisable, but at the same time you need to have enough make-up subtly applied to ensure it with-stands the heat and of course the flash of the camera! The�flash from a camera reduces how make-up looks dramatically. �What you thought was a natural look changes into a no make-up at all look. You also need to watch out for products such as moisturisers, foundations and powders with an SPF�that create a white ghostly effect on your face when flash photography is used - so your face will not match your body colour. Eeeek indeed!�Other products can affect how shiny your skin appears in your photos. Many of us�(myself included)�play it safe�when it comes to make-up and use the same colours, products and techniques every day! A professional make-up artist is trained to look at what colours and techniques are needed to enhance your best features.�They also have the best products and tools such as professional make-up brushes that would cost us a small fortune to buy ourselves, readily available! Also on the day itself, what better way to know you've got a professional creating your fabulous look with no effort required at all on your part! Professional wedding make-up artists are very much�used to working to a schedule and ensure that the bride and bridal party are made up in plenty of time!